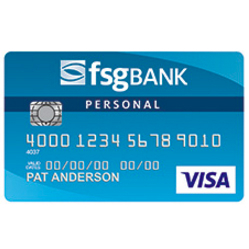 FSG Business Credit Card: Free employee cards with individual credit limits. FSG Business Bonus Credit Card: Earn 1 point for every net $1 you spend, plus get a 25% bonus on all points earned every month. FSG Business Bonus Plus Credit Card: Earn 1 point for every net $1 you spend, plus get a 50% bonus on all points earned every month. FSG Business Credit Card: 0% intro APR for the first 12 billing cycles on purchases. FSG Business Bonus Credit Card: Introductory 0% APR for the first 6 billing cycles on purchases. $25 cash back with your first purchase. FSG Business Bonus Plus Credit Card: Introductory 0% APR for the first 6 billing cycles on purchases. $50 cash back with your first purchase. $19 on balances up to $100, $29 on balances from $100 up to $250, $39 on balances of $250 or more. FSG Business Credit Card: 9.99% to 20.99% APR based on your creditworthiness. FSG Business Bonus Credit Card: 11.99% to 22.99% APR based on your creditworthiness. FSG Business Bonus Plus Credit Card: 11.99% to 22.99% APR based on your creditworthiness.